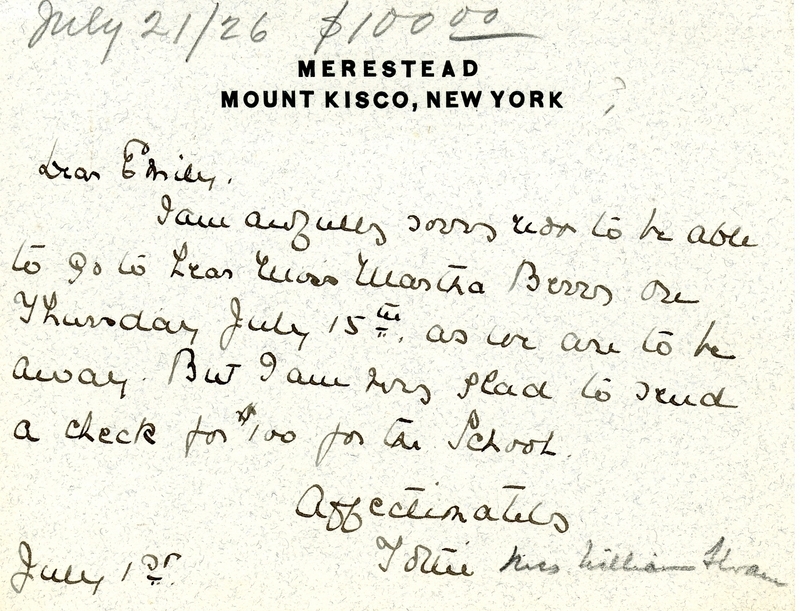 Mrs. William Sloane is sorry to miss meeting Martha Berry because she will be away, but she is sending Emily a check for one hundred dollars to pass along to Berry. Mrs. William Sloane, “Letter from Emily Thorn Vanderbilt Sloane to Emily Vanderbilt Hammond.” Martha Berry Digital Archive. Eds. Schlitz, Stephanie A., Sherre Harrington, Christy Snider, Angela McCavera, et al. Mount Berry: Berry College, 2011. accessed April 20, 2019, https://mbda.berry.edu/items/show/152.